This has been a busy week. I had to record an audition for a voice over job, reading a short script into my cousin’s phone to make an MP3 recording. I’d never done that before, but it was pretty easy when Zach showed me how. I didn’t get the part, though. The casting director sent a nice email and said I did a good job, but they picked somebody else. That’s ok — the more auditions you go on, the more chances you have to get a gig! I had an audition yesterday for a movie part. Usually, they send you a script, and tell you how to dress. But this one was different. They sent a one-line description of what we were supposed to do in the audition. This is what it said: Remember to be SASSY and have natural movements. Do not stand there straight like a stick and never move. So I did, and came back and juggled balls for a couple of minutes. I looked sad…and that was that. Definitely the most unusual audition I’ve ever done! Hope I get the part! But I think that since I’m the young version of the lead actor, it will depend on who gets cast for the lead. They will want a kid who looks like he could be the younger version of whatever actor gets that part. So it may not be about the audition at all, just about how you look compared to the lead actor. Then I went home and worked on my science fair project for several hours. It’s due on Tuesday, and I still have a lot of work to do to finish it. Then we went to see The Dallas Sidekicks beat the Chicago Mustangs. It was a long day that started at 6:30 and didn’t end until after 10:30 p.m. The strangest thing is how the weather changed. On Friday night, at the party for Cirque Banquisté volunteers and cast members, it was so warm that most of us spent most of the evening outside. It was about 75 degrees, and the perfect night to be outside with your friends. On Saturday, it was cold and wet. When we were going into the Allen Events Center for the soccer game, the wind was so cold it made everybody shiver. Today, it’s warm and sunny again. Strange weather! I wish it would snow again. We has a white Christmas this year, but the snow only lasted one day. But if it doesn’t snow, I wish it would stay warm and dry. Cold and wet is no fun unless there’s snow to play in! 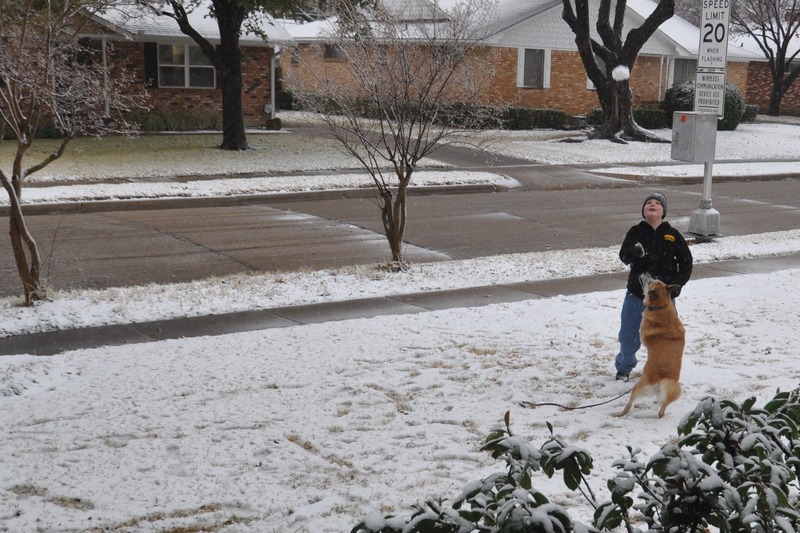 My sister’s dog Jasmine loves to play ball — and she got kind of mad that she couldn’t catch snowballs on Christmas day. 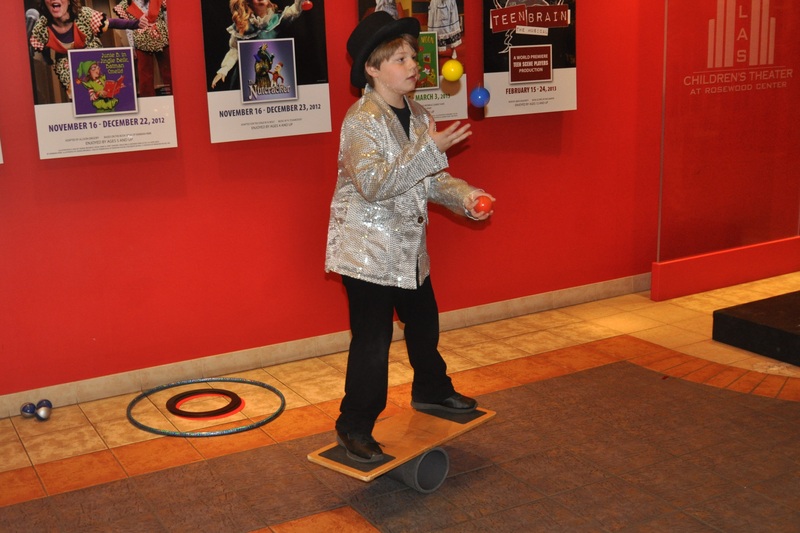 This is me wearing my Captain Sparkles jacket and juggling on the rola bola in the lobby at Dallas Chidlren’s Theatre during the pre-show for Cirque Banquiste.